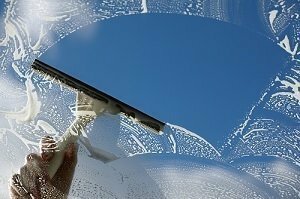 Have you ever tried cleaning your windows all by yourself? If you have, you probably know how challenging it can be, especially if there are fingerprints and other oily marks. The window cleaning products available in retail stores work to a certain degree only. Some of them are partially ineffective, while others are almost impossible to rinse. Moreover, if you use a paper towel, it could leave behind a lot of streaks and lint. The easiest way to get perfectly clean windows would be to hire a Window Cleaning London service. But if you decide to clean your windows alone, there are a few secrets and techniques that could help you clean your windows more effectively. If you are interested, continue reading, as we are going to discuss some of them here. The best window cleaning solution is a mix of vinegar and warm water in equal parts. If the temperature outside is low, you can add half a cup of denatured alcohol in order to prevent the solution from freezing on your windows. If you brush the glass surface before cleaning it, you will make your job less difficult. Most of the dust will be removed without wetting the glass and turning the dirt into mud. If you start with the interior area of the windows, you will save both your cloth and the cleaning formula, because interior is often less filthy than the exterior. If you start with the dirty part, your sponge or cloth will get dirty more quickly, therefore making you utilize more of them. If you need to understand more regarding our Window Cleaning London, please be sure to call us on 020 3322 8261.